Canoeing trips on the Mersey River in Kejimkujik National Park, Nova Scotia are the best way to see the beautiful scenery that surrounds the region. Canoeing trips on the calm waters of the Mersey River in Kejimkujik National Park in Nova Scotia, Canada brings to light the beauty that surrounds the banks of the river. This woman gently paddles the canoe looking for extraordinary places to explore while enjoying the tranquility under the sun. Paddling a canoe on the Mersey River in Kejimkujik National Park and National Historic Site of Canada, Kejimkujik Scenic Drive, Highway 8, Nova Scotia, Canada. Model Released. 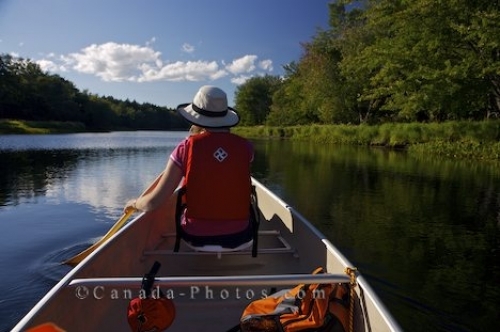 Picture of a woman on a canoeing trip along the Mersey River in Kejimkujik National Park in Nova Scotia, Canada.